As we move towards the middle of 2013, there are there are several key economic indicators to demonstrate appraisers must once again face the challenge of changing markets. Home prices are on the rise. But are appraisers ready to embrace the challenge and recognize that real estate markets have finally turned? Of more consequence, can appraisers be certain that this housing market is sustainable? Last week, CU Appraisal Services LLC (CUAS) hosted two roundtable meetings attended by 70 appraisers from 6 states to discuss changing markets. The discussion focused around the Realtors Confidence Index for April 2013. Today, Realtors are reporting rising prices and shorter days on market. Data released by S & P Dow Jones Indices for its S & P/ Case-Shiller Home Prices Indices showed home prices had strong gains in the first quarter of 2013. The 20-city S & P Case Schiller House price index for March 2013 climbed 10.87% on the year. This is the fasted pace increase since April 2006. On the month home prices were up 1.12%, above expectations for a 1 % rise. As appraisers, we are faced with making choices that are uncomfortable. We should refrain from generic form-filling and begin to ask the tough questions. Is property value increasing in our market and if so, is this increase sustainable? What are the current inventory levels and how is that likely to impact marketing times. For each assignment we must begin afresh to examine markets, as of the effective date of the appraisal. In short, appraisers must refrain from defensive appraising. Starting now, we must look through the windshield and limit watching the rear view mirror. Analysis and reconciliation must become the cornerstones of a credible market value opinion. Now is the time to begin a dialogue of value sustainability. Is this merely a spring/ summer price bubble? As appraisers it is important that we research and communicate. We should be interviewing market participant and building relationships with Realtors, builders and other real estate professionals. Appraiser independence regulations protect us from pressure and give us the freedom to build these networks for better business and more accurate analysis. We must collaborate with other appraisers, join organizations, state coalitions and physically attend seminars and education events. "As appraisers, our jobs are not merely to inspect and report but analyze and reconcile. Only then will we gain respect as professionals"
As appraisers, our jobs are not merely to inspect and report but analyze and reconcile. Only then will we gain respect as professionals. If inventory levels are low, good comparable sales are limited. We must therefore discover how to use the ones we have well. This means we make supported adjustments for key elements of comparison using recognized methods and techniques. We cannot rely on “experience and intuition”. It is time for us to revisit our tool box and begin using the skills we learnt in the classroom: matched pairs; regression analysis; market extraction; modified age life; highest and best use analysis among others. Our clients, intended users and consumers will respect the due diligence and realize the worth of our product. Appraisers must now break out of the box our clients, the secondary market and traditional AMCs have put us in. We have fought and won many battles over the last few years: appraiser independence; customary and reasonable fees and AMC registration. Now, we must prove we are the leaders and experts in real estate value. I challenge all appraisers to re-examine their appraisal practice. How will you be seen forensically in years to come? What will be your legacy? Now is the time to shake the cobwebs of the offensive playbook and look forward with courage, knowledge, integrity and expertise. Realtors Confidence Index. Report and Market Outlook. April 2013 Edition. Based on Data Collected April 29 through May 6, 2013. National Association of Realtors. Fannie Mae’s February 2013 National Housing Survey results are IN! WASHINGTON, DC – Consumer attitudes toward the economy and housing continue to diverge this winter, according to Fannie Mae’s February 2013 National Housing Survey results. On the one hand, consumers continue to express strong positive attitudes toward housing. On the other hand, sentiment about the economy and household finances is stalled. Average 12-month home price expectations and the share of consumers who believe home prices will go up over the next year both rose to record highs, and the percentage of Americans who say mortgage rates will rise reached its highest level since August 2011. At same time, Americans’ views on their personal financial situation, household income, and the direction of the economy fell or remained flat. “Despite fiscal headwinds and political uncertainty, consumer sentiment toward housing is robust and continues to gather strength,” said Doug Duncan, senior vice president and chief economist at Fannie Mae. “We expect home prices to firm further amid a durable housing recovery, gradually reducing the population of underwater borrowers and helping to boost the share of consumers who say that now is a good time to sell." The average 12-month home price change expectation increased 0.5 percent over last month to 2.9 percent, the highest level since the survey’s inception. At 48 percent, the share who believe home prices will go up in the next 12 months also reached a survey high, while the share who believe home prices will go down held steady at the survey low of 10 percent. The percentage who think mortgage rates will go up increased by 4 percentage points to 45 percent, the highest level since August 2011, while those who think they will go down held steady at 7 percent. Twenty-five percent of respondents say it is a good time to sell a house, the highest level since the survey’s inception in June 2010. At 3.9 percent, the average 12-month rental price change expectation increased 0.2 percent over January. Fifty percent of those surveyed say home prices will go up in the next 12 months, holding steady from January at the highest level since the survey’s inception. The share of respondents who said they would buy if they were going to move increased by 2 percentage points to 67 percent. At 38 percent, the share of respondents who say the economy is on the right track has held steady over the past three months. The percentage who expect their personal financial situation to get better over the next 12 months fell by 2 percentage points to 41 percent. Twenty-one percent of respondents say their household income is significantly higher than it was 12 months ago, a 2 percentage point decrease from last month. Thirty-one percent report significantly higher household expenses compared to 12 months ago, a 7 percentage point decrease and the lowest level since June 2010. The most detailed consumer attitudinal survey of its kind, the Fannie Mae National Housing Survey polled 1,008 Americans via live telephone interview to assess their attitudes toward owning and renting a home, home and rental price changes, homeownership distress, the economy, household finances, and overall consumer confidence. Homeowners and renters are asked more than 100 questions used to track attitudinal shifts (findings are compared to the same survey conducted monthly beginning June 2010). Fannie Mae conducts this survey and shares monthly and quarterly results so that we may help industry partners and market participants target our collective efforts to stabilize the housing market in the near-term, and provide support in the future. For detailed findings from the February 2013 survey, as well as a podcast providing an audio synopsis of the survey results and technical notes on survey methodology and questions asked of respondents associated with each monthly indicator, please visit the Fannie Mae Monthly National Housing Survey site. Also available on the site are quarterly survey results, which provide a detailed assessment of combined data results from three monthly studies. The February 2013 Fannie Mae National Housing Survey was conducted between February 2, 2013 and February 21, 2013. Interviews were conducted by Penn Schoen Berland, in coordination with Fannie Mae. Opinions, analyses, estimates, forecasts, and other views of Fannie Mae's Economic & Strategic Research (ESR) Group included in these materials should not be construed as indicating Fannie Mae's business prospects or expected results, are based on a number of assumptions, and are subject to change without notice. How this information affects Fannie Mae will depend on many factors. Although the ESR Group bases its opinions, analyses, estimates, forecasts, and other views on information it considers reliable, it does not guarantee that the information provided in these materials is accurate, current, or suitable for any particular purpose. Changes in the assumptions or the information underlying these views could produce materially different results. The analyses, opinions, estimates, forecasts, and other views published by the ESR Group represent the views of that group as of the date indicated and do not necessarily represent the views of Fannie Mae or its management. Fannie Mae enables people to buy, refinance, or rent a home. We play a leading role in America's economic recovery today and in building a better housing finance system for the future. The big news: After six years without any sign of improvement, REMODELING's 2013 Cost vs. Value Report shows an overall cost-value ratio increase of 2.9% over the 2011-2012 number. This reflects rises in the cost-recouped percentages for all 35 home improvement projects tracked by the report, with replacement projects leading the way with the biggest gains. Data for all projects in 81 cities is now available, for free, at http://www.costvsvalue.com. Last month, the Appraisal Institute released “Guide Note 12: Analyzing Market Trends,” a resource designed to give AI members an analytical framework for studying market trends while developing a market value opinion on a property. The Guide Note is particularly concerned with challenges faced by appraisers when market conditions are rapidly changing, as demonstrated by recent boom and bust cycles of the U.S. housing market. In slower markets like today’s, the Guide Note recognizes that a lack of market data is challenging to appraisers attempting to make market value adjustments. Indeed, appraisers commonly face such challenges and more in today’s markets. Underlying market conditions are far from stable; continued downtrends in home prices often require appraisers to apply appropriate market trend adjustments to recent comparable transactions. Moreover, in many distressed markets it is also likely that some or all available recent transactions are distressed sales. Since the parties to distressed properties are often unique and distressed properties are typically sold at a significant price discount, which may or may not represent underlying market trends, appraisers are challenged with deciding whether such distressed sales are relevant market data for non-distressed transactions or whether adjustments are needed to better extract relevant market information. Our results show that appraisal value can differ quite significantly from contract price despite the fact that nearly one in three pre-closing sales transactions appraise at exactly the contract price. Of a sample of purchase-mortgage appraisals on single-family homes and condominiums completed between January and May 2012, about 24% are appraised above contract by 3.0% or more. Combined with another 8-9% appraised at below contract by 3% or more, nearly a third of the purchase-loan appraisals contain a market value opinion differing at least 3% in value from the contracts. More importantly, our results show that appraisal valuation appears to be performing the important risk management function it is designated to do for lenders’ mortgage transactions: helping to ascertain the fair value of the underlying collateral. Our data reveal a strong positive correlation between indications of market inefficiency and appraisal valuation’s tendency to move away from a contract price; when underlying market conditions are more inclined to produce less efficient transaction prices, there is a greater chance that appraisal value will deviate from the contract price. A statistical probability model is used to analyze how market conditions affect the likelihood that a significantly different appraisal value will be observed. In this study, a significantly different appraisal valuation is defined as one in which appraised value falls below or above contract by at least 3% of contract price. More active markets – defined in this study as having at least 10 non-distressed sales in a prior month – are associated with lower probability of observing significantly different appraisal valuation. A more active market makes gleaning information more efficient. Greater market distress – measured by the proportion of distressed properties in total homes sales in the prior three months – is associated with a higher probability that a significantly different appraisal valuation will be observed. More specifically, market distress increases the probability of appraisal valuation falling significantly below the contract price. REO or short sale properties are more likely to be appraised at higher value than the contract price. Sellers of such properties are driven to make a quick sale and are typically willing to ask a price significantly below the property’s fair market value in exchange for liquidity. However, market-based appraisals have often been criticized for failing to support potential mortgage transactions – especially if the adjustments result in a lower appraised value than the contract price. Our analysis reveals appraiser due diligence in the process of developing a market value opinion on the underlying collateral. Meanwhile, we find the majority of appraisals provide a valuation that supports the contract price. As shown below, the evidence does not support the claim that low appraisal valuation has prevented contract closings. According to a newly released report from the General Accounting Office, “Residential Appraisals: Regulators Should Take Actions to Strengthen Appraisal Oversight,” the nation’s five largest lenders obtained appraisals for 98% of home purchase mortgages sold to the GSEs or insured by FHA. Bill Dabney, manager of public relations FNC, Inc. Since 1999, FNC has pioneered real estate information technology, automated appraisal ordering, tracking, documentation and review for lender and servicer compliance with government regulations. FNC’s platforms are in production at seven of the 10 largest U.S. mortgage lenders and provide value to large and small lenders with reduced costs and more efficient loan processing. With collateral management platforms, data and analytics, FNC provides advanced insight into the property backing a loan from origination to capital markets. Visit FNC online at www.fncinc.com. Housing stimulus programs are history. Home buyer tax credits are water under the bridge. Still, they're part of explanation for why we're where we are, economically speaking, trying to extract ourselves from a funk the likes of which only those who lived through the Great Depression can remember. Here, the Atlantic's Daniel Indiviglio tries to shed light on the distortive effect of the home buyer tax credit on reisdential investment, and therefore, the economy, by regraphing the quarters and pulling out the stimulus' impact.
" GDP growth (red) and then imagined what GDP would have looked like without the credit (blue). In my estimate, residential investment dropped to $321 billion in the third quarter of 2009 -- where it fell to when the home buyer credit was removed last summer and has hovered around ever since. Here, you see that the third quarter of 2009's pop looks a little weaker. But growth looks better in most of the quarters that followed -- especially the third quarter of 2010, during which time the big fall in residential investment due to the credit's expiration cut GDP. Better home sales would have had some effect on other aspects of GDP as well -- but just like you're seeing here, removing those effects in later quarters would have created an adverse effect." Like other important economic events, we'll need more history to run its course before we'll be able to say it's positive or negative. Housing remains stuck in the doldrums even with extremely low mortgage rates and despite some improvement in private payroll employment. Part of the reason for this disconnect is the slew of foreclosures and bank-owned properties which are still flooding the housing market. Defaults are expected to reach new record-highs this year which have buyers holding out for better deals and traditional home-sellers battling low-ball offers from banks. The aggressive pricing on distressed properties is undercutting individual home sellers and new home builders alike, and wreaking havoc on local housing markets. The Departments of Housing and Urban Development (HUD) and Treasury released their Monthly Housing Scorecard for February on Wednesday afternoon according to Jann Swanson's Mortgage News Daily article. This monthly report is an attempt to encapsulate the Obama Administration's efforts to stabilize the housing market and provide a snapshot of the status of that market. It contains a round-up of information from both public and private sources. The Scorecard is issued simultaneous with the release of the monthly report on the Making Home Affordable Program (HAMP). According to the Scorecard, the housing market remains fragile as data through January paint a mixed picture of recovery. On the sales front there was a little good news as sales of existing homes ticked up to 446,700 in January compared to 435,000 in December. New home sales, however, dropped from 27,100 to 23,700. The inventory of existing homes fell by slightly less than 200 thousand to 3.38 million while the supply of new homes was almost flat at 188,000. There is a 7.6 month supply of existing homes compared to 8.2 months in December and a 7.9 month supply of new homes as compared to 7.0 months. Over 3.6 million homes are currently vacant and held off the market for a variety of reasons. This is an increase of 45,000 since December. STAMFORD, Conn., Jan. 26, 2011 /PRNewswire/ -- CompuTaught, part of Cengage Learning and a leading developer of computer-based real estate education, today unveiled a new series of live, instructor-led, advanced appraisal courses that will be offered online via WebEx. The new online courses feature CompuTaught's standard online registration, administration and learning management support systems while combining real-time instruction with WebEx's synchronous, interactive delivery, bringing a live classroom experience to the student's personal computer. These live, online appraisal courses have gained both International Distance Education Certification Center (IDECC) and Appraiser Qualification Board (AQB) approval and will be delivered in accordance with individual state regulations. With all of the features of an onsite classroom and more, the courses feature a virtual classroom environment with audio, video, screen and document sharing, chat and other interactive elements, with instant access to required course materials. To aid with testing and engagement, the classes also include incremental assessment exams which are reviewed live by the instructors to ensure understanding. Courses include random individual student inquiries throughout the duration to verify student identity and engagement. In addition, students receive information on scheduling the proctored final exam for the course (if required). "Moving through this digital age, the traditional classroom is shifting and a recent growth in online education is giving us the opportunity to transform the way we teach and deliver content," said Dave Shaut, vice president, CompuTaught. "These new live courses combine the trusted reliability of our computer-based real estate and appraisal education with the convenience of live instruction. We strive to continually evolve with our ever-changing customers and provide them with the most convenient and cost effective ways to work toward their real estate and appraisal education goals." The NEXT course to be introduced, Statistics, Modeling and Finance, will be offered on Feb. 22 and Feb. 23, 2011. The course will be led by Certified General Real Estate Appraisers and award-winning instructors Mark A. Munizzo and Lisa Virruso Musial. 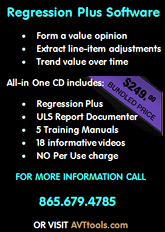 This course comes at an important time for the industry, as Bradford Technologies' Appraisal Industry Predictions for 2011 indicate that certified residential appraisers and other real estate professionals are searching for courses on statistics, applied regression and advanced valuation skills to stay current or advance their career. Courses are IDECC, AQB and State approved and delivered online via WebEx. For state specific information, click here http://www.careerwebschool.com/ , THEN click on Appraisal / Continuing Education on the right, THEN select your state. On the next screen, click on the red "View Online Instructor-Led Courses" button. "Many students operate under the false impression that online learning is inferior to a traditional classroom," said Sam Martin, educator, certified appraiser and creator of samthetutor.com. "In fact, according to a recent white paper from the U.S. Department of Education, online courses are just as effective as conventional classroom instruction, proving these new courses from CompuTaught as a convenient and interactive alternative for students who are seeking state approved education." For more information on the new courses, CompuTaught's Educational Referral Network program or other online or computer-based courses offered, please visit www.computaught.com or www.cengage.com. CompuTaught, part of Cengage Learning, is a market leader in the computer-based real estate learning market. In 1989, CompuTaught was the first in the country to offer state-approved real estate licensing courses on computer and continues to be the leading developer of computer-based education for the real estate and appraisal professions. It currently distributes its courses through more than 300 independent schools, with about 50,000 enrollments annually. For more information on CompuTaught, please visit www.computaught.com. According to the latest S&P/Case-Shiller Home Price Index, the annual growth rates of all 20 MSAs and the 10- and 20-City Composites improved in April compared to March because of the home buyer tax credit program that ended April 30, 2010. New York, June 29, 2010 – Data through April 2010, released today by Standard & Poor’s for its S&P/Case-Shiller1 Home Price Indices, the leading measure of U.S. home prices, show that annual growth rates of all 20 MSAs and the 10- and 20-City Composites improved in April compared to March 2010. The 10-City Composite is up 4.6% from where it was in April 2009, and the 20-City Composite is up 3.8% versus the same time last year. In addition, 18 of the 20 MSAs and both Composites saw improvement in prices as measured by April versus March monthly changes. The chart above depicts the annual returns of the 10-City and 20-City Composite Home Price Indices with increases of 4.6% and 3.8%, respectively, in April 2010 compared to the same month last year. Of note, Dallas, Denver, San Diego and San Francisco have all posted six consecutive months of positive annual rates of return, recording +3.3%, +4.4%, +11.7% and +18.0% in April, respectively. “Home price levels remain close to the April 2009 lows set by the S&P/Case Shiller 10- and 20-City Composite series. The April 2010 data for all 20 MSAs and the two Composites do show some improvement with higher annual increases than in March’s report. However, many of the gains are modest and somewhat concentrated in California. Moreover, nine of the 20 cities reached new lows at some time since the beginning of this year. The month-over-month figures were driven by the end of the Federal first-time home buyer tax credit program on April 30th. Eighteen cities saw month-to-month gains in April compared to six in the previous month. Miami and New York were the two that fared the worst in April compared to March. New York is the only MSA to have posted a new relative index low with April’s report.” says David M. Blitzer, Chairman of the Index Committee at Standard & Poor’s. The chart above shows the index levels for the 10-City and 20-City Composite Indices. As of April 2010, average home prices across the United States are at similar levels to where they were in late summer/early autumn of 2003. From their peak in June/July of 2006 through the trough in April 2009, the 10-City Composite is down 33.5% and the 20-City Composite is down 32.6%. The peak-to-date figures through April 2010 are -30.5% and -30.0%, respectively. New York posted a new index low in April, as measured by the current housing cycle, where it peaked in June 2006. The peak-to-trough figure is -21.7%. Eighteen MSAs and both Composites showed monthover- month improvements in April. The 10- and 20-City Composites were up 0.7% and 0.8%, respectively. Eleven of the MSAs reported monthly increases of at least 1.0%. Miami and New York were down 0.8% and 0.3%, respectively. San Diego has now shown 12 consecutive months of positive returns. It is the only market that did not contract in the late winter months. The Illinois Coalition of Appraisal Professionals (ICAP) is pleased to announce registration for the 2010 summer seminars is now available on-line at http://www.icapweb.com/education.php. As usual, two seminars will be held this summer. The first seminar will be held on July 7th in Springfield at the Crowne Plaza hotel. The second seminar will be held August 11th in Lisle at the Hilton hotel. “We are extremely excited about the seminars this year. The committee did a fantastic job of selecting topics and speakers. The people in attendance are really going to enjoy the day and will find the seminar to be pertinent to their daily work as real estate appraisers”, said Randy Neff, seminar chair. "As is tradition of the seminars, Mr. Brian Weaver, IDFPR appraisal coordinator, will be the keynote speaker." The seminars will be headlined by Mr. Patrick Egger of Las Vegas, NV and Mr. Anthony Young, of San Ramon, CA. Mr. Egger will speak on the importance of analyzing key economic indicators in projecting trends in the real estate market. Mr. Young will speak on graphing market trends and then incorporating the graphs into appraisal reports. Ms. Markie Lemons of Chicago will give a presentation on short sales. “ICAP seminars are not typical real estate appraiser CE seminars. Here's a little more info on the speakers this year and their topics . . .
Market Analysis: What moves the market? Indicators, Ratios and Relationships. "It’s often said that an appraisal is merely a “snapshot in time”. While snapshots provide a glimpse of what’s happening, they’re like tombstones, telling the reader little more than born when, died when an who’s in the grave. Presenting a simple matrix of key indicators will turn a market glimpse into market perspective. The key to any report is how you communicate your observations and conclusions to someone reading that report. A simple matrix of key indicators will inform the reader on what is motivating the market and why. In turn, you can use the same matrix and indicators to logically support your conclusions in key sections of the report, such as market trends, adjustments and the reconciliation." "Not only is the information readily available, it only needs to be updated monthly or quarterly; and it can be used with any type of report, transforming static snapshots into dynamic perspectives. Clients expect reasonable conclusions. They also require rational explanations and support for those conclusions. The Data tells us what happened, however it doesn’t tell us why it happened. This is where the matrix will help the appraiser and the reader comprehend where the market was, where it is now and what factors may determine where it is headed." Another one of the ICAP guest speakers is Anthony Young. Anthony is an active appraiser from San Francisco. He is going to illustrate how to graph housing trends using excel and inserting them into appraisal reports. Here's an example of one of his Appraisal Scoop articles. Anthony Young is a Certified Residential Appraiser and principle of Young & Associates Real Estate Appraisal Company in San Ramon, California, where he specializes in the valuation of complex and "high-end" residential properties and housing market trend analysis. He enjoys showing Real Estate professionals graphing and charting techniques for studying the buying behaviors to conclude adjustments in valuations and has developed a How-To-Do-Trend-Analysis DVD that teaches professionals to measure (and visually graph) the behavior of the Real Estate Marketplace over time and to provide supported and credible results within the appraisal report. Both Patrick and Anthony will be speaking in the afternoon. The afternoon session will include a real estate agent from Chicago, also known as the foreclosure queen, and Brian Weaver from IDPFR. Marki Lemons will give a presentation on short sales, what they are, how they impact the market, how price is negotiated and other fundamental items about short sales. She specializes in short sales and foreclosures. Sounds like a great lineup this year!!! ICAP is using the Appraisal Institutes online education platform to register for the 2010 summer seminars. This is the second year we have used this platform. You will have to create a username and password before you can register for the course. As an ICAP member, you will receive a $25.00 discount for the class if you use the following promo codes. These codes are case sensitive so please type them as they appear below. Click on the following link to register….DON’T DELAY!! !